Buy NTR Mahanayakudu Ticket, Watch Lakshmi's NTR! It's been officially announced that 'NTR Mahanayakudu' will be hitting the screens on February 22nd, 2019. Ram Gopal Varma was quick to come up with a bumper offer for all those who are preparing to watch Part 2. The Controversial Filmmaker announced that theatrical trailer of 'Lakshmi's NTR' will be screened in all the theaters of 'NTR Mahanayakudu'. RGV: 'Trailer of #LakshmisNTR is releasing on February 14th at 9.27 am. Theatrical Trailer will release on Feb 22nd with NTR Mahanayakudu. So, Whoever comes to the theatre to see Mahanayakudu can see trailer of #LakshmisNTR'. Here is the best marketing strategy, 'Buy NTR Mahanayakudu Ticket - Watch Lakshmi's NTR For Free'. 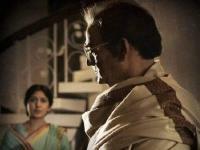 Ram Gopal Varma is yet to announce the release date of 'Lakshmi's NTR'. What is the reason behind the delay of release?